I came into SL to take care of some business, four hours after I had left the previous session, and to my surprise I noticed that Fael and Moon were still at the tea house. It turned out that they had created a little master piece performance, in which they could let an avatar sing a lovely German children’s song, together with an angelic posture and beautiful light effects all around the singing figure. I stayed for a while, to see the performance and to chat. Further below I include the 7 am morning session, with the chat log and comments sent to me by Fael, the guardian for that session. The picture toward the end was taken by Pia. Pema Pera: throughout my whole dinner!! After Dakini had joined us too, the four of us chatted for a while, and then Spock joint us as well. So we had Dakini in the US, Spock in Spain, Moon in Germany, Fael in Finland, and me in Japan, all standing here together in front of the tea house in Rieul. At that moment Moon started his performance, after he had rezzed a wooden stage on the lawn. Pema Pera: wunderbahr . . . . .
Pema Pera: clap clap clap ! ! ! ! Pema Pera: so how did you do this, what were the ingredients? Fael Illyar: Moon, does it still have something that needs fixing? Moon Fargis: no everything is great! Pema Pera: one of those days . . . . The performance very much reminded me of the Saint Lucia songs in Sweden, but the custom didn’t seem to be known much nearby, neither in Denmark, nor in Finland, as I was about to hear. Pema Pera: December 13 I believe? Pema Pera: zusammen bringen . . . . .
Pema Pera: wie schoen . . . .
Fael Illyar: Moon did one of the particle effects and I did the other. und doch so weit entfernt ein stern. den goldenen stern, doch er ist so fern. ich könntem ein lied mit ihn singen. Pema Pera: wanna translate the text Herr Mond? Pema Pera: thanks a lot! Meanwhile Dakini had started to play with a Babbler version, an automatic translation engine that she had found. She gave us copies as well, but we had some difficulties getting it to work. xDakini: Dakini welcome to Babbler3. Have fun! For more information, visit http://www.maxcase.info/babbler3. Babbler3: Dakini: Dakini welcome to Babbler3. Have fun! For more information, visit http://www.maxcase.info/babbler3. Pema Pera: what is this babbler? Pema Pera: Do I have to go to Phreak Island? Delivery Pylon.72 : Green owned by Max Case gave you ‘Babbler3.17′ ( http://slurl.com/secondlife/Green/190/153/20 ). Pema Pera: Do I just wear it? Babbler3.17: Pema welcome to Babbler3. Have fun! For more information, visit http://www.maxcase.info/babbler3. Pema Pera: and now what? Pema Pera: how to activate? Pema Pera: have you used babbler, Fael? Pema Pera: can you give it to Fael? We kept puzzling over it. We kept trying a bit more. Dakini Rhode: i’m getting blank translations… are you getting anything? Fael Illyar: This should translate my text now. Dakini Rhode: did that just translate you Pema? Pema Pera: nice to meet you SlimeX! SlimeX Grossman: are u a group? ryusho Ort: what is “blabbler”? I took the opportunity to give a quick PaB introduction. ryusho Ort: what does it do? I said in Japanese that I was talking myself, to tell Ryusho that it is not the automatic translator writing the Japanese, but me typing directly on my keyboard. However, my short sentence was not clear enough, and this let to an amusing misunderstanding. SlimeX Grossman: can i do something quikly? ryusho Ort: it says yes and but! SlimeX Grossman: like pop something out? ryusho Ort: why you say is not?? Hahaha, I had just typed “I can speak Japanese too; this is not a machine but a human being (typing)”. Ryusho still thought “it” was working for me :>). Pema Pera: no machine involved . . . .
SlimeX Grossman: where did my unit go?? Pema Pera: funny that you thought I was a machine, Ryusho! ryusho Ort: why did you bring this ghulabala here slimex!!??? Dakini Rhode: did you make this SlimeX? However, everybody’s attention was taken up by SlimeX rezzing some huge structure next to the tea house, partly penetrating the tea house and looming over it. ryusho Ort: pema: i did not say you are a machine! why you said that? Dakini Rhode: did you know this is on my teahouse, slimeX? ryusho Ort: she said it would not work so i tought you were trying it out! Pema Pera: are you Japanese? Pema Pera: yes, I understand! Pema Pera: wow, quite a build here!! Ryusho had answered me that he was not Japanese, and he then started speaking Chinese instead. Since the characters were similar, because Japanese is derived from Chinese, I could more or less understand what he said and I tried to translate the characters one by one to get a sense. SlimeX spoke in Chinese as well. Pema Pera: hmm, not this chinese like? SlimeX Grossman: ni shuo de dui! Dakini Rhode: yes were you showing us this? ryusho Ort: or i will remove HIM! SlimeX Grossman: should i remove the house? ryusho Ort: slimex take this ugly thing away!! ryusho Ort: before i take you! The large structure disappeared as quickly as it had appeared in the first place. ryusho Ort: finally some peace! ryusho Ort: you have time to try out the outfit already? Pema Pera: Nice meeting your both, ryusho and SlimeX! ryusho Ort: nice meeting you! Pema Pera: how do you say good night in Chinese? I left SL and returned an hour later. I found Fael and Pia at the tea house, for the 7 am session. As I mentioned above, Fael was the guardian for that session, and from here on the comments are hers. I was at the teahouse waiting for others to arrive and Pia happened to be the first one. Pia Iger: Hi, Fael, are you Guardian today? Pia Iger: good. Do you want to sit outside? I feel like it. Pia Iger: I am adjust the view. Pema arrived a few minutes later. Pema Pera: Good to see you again, Pia!! Pema Pera: And Fael, you have had a six hour session now? Pema Pera: glad you’re taking root here! Pema Pera: Pia, did Fael show you what she has created, together with Moon? 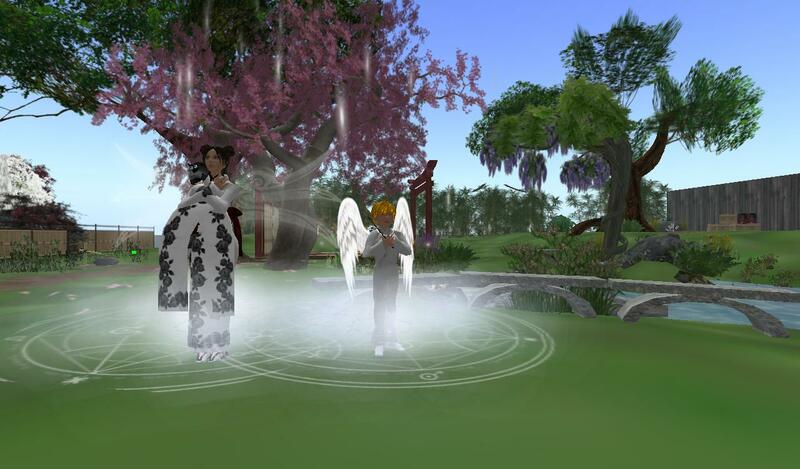 I had helped moon with particles and scripts with a scripted gesture (ccs) he wanted to give to someone. We completed it after the 1am PaB meeting. Pema Pera: wonderful, Fael, so sweet ! Pema Pera: and what wonderful visuals too! Pia Iger: what is the lyrics about? Fael Illyar: You’ll have to ask moon for those. I do have them in my logs but might take a while to find them. Pia Iger: I notice Moon and Fael are very creative. They made so many things. Pema Pera: yes, I mentioned that if we leave them here for a week, we won’t recognize the place anymore . . . . I grew a bit uncomfortable with the topic so I decided to see if I could divert it. Fael Illyar: I think PaB and this more traditional Zen meditation I’m now doing every morning since Wednesday has reduced my fear of wasps somewhat. Pia Iger: fear of wasps? Pema Pera: :) we have one black and yellow big crawling insect here, but it doesn’t make noise . . . .
Pia Iger: How do you feel now when you think about wasps,etc? I was trying to point out an insect on the teahouse terrace and was highlighting it with my selection beam. Fael Illyar: Still scary but it’s starting to be in manageable range. Pia Iger: test Fael right away! Pema Pera: fortunately it is walking away! Pema Pera: does stinging count? I felt the need to point out I wasn’t scared of mosquitoes. You either stop fearing them or you die of fear when you’re swimming in them for 2 months every summer. Pema Pera: a special event? Pia Iger: The bug should go the other way! Pema Pera: Pia, have you heard the gong before? Pia Iger: yes. I think Fael and Moon made them last weekend. Pia Iger: They do things right away, efficient! Pema Pera: do you want to tell us what the special event was, what triggered your anxiety? Pia Iger: I was talking about the purple bug you just put out. it was coming my way. i felt nervous. Fael Illyar: I was out doing something with my mother and suddenly one stung her in the arm. That’s what I think is the trigger. Pia Iger: Most anxiety is from out expectation of bad things. Bogadaeius chose this moment to arrive. Pia Iger: that is why I think early child care is very important. Fael Illyar: I think it was traumatic because it was so much out of the ordinary. Pema Pera: but I think Fael so far has been the first !! Fael Illyar: Another contributing factor might be that it wasn’t me who got stung, so I was left imagining what it was like. Pia Iger: She is also the first who get on PaB practice right away and do it very often. Pema Pera: yes, very focused! Pema Pera: But so are you, Pia! Pema Pera: Nice effects, Bog! Pia Iger: thanks. I feel very encouraged since Fael and others are doing it seriously too. Bogdaeius Bookmite: thank you,. Hey Spock. Fael Illyar: Should I show the scripted gesture again now that we got more people? Fael Illyar: My own way is quite serious and analytical too. Pia Iger: I want to see it again, since I adust to a better view now. Pema Pera: it fits her sense! Moon arrives just in time. The performance. Everyone is silent. Fael Illyar: ghosted? invisible except for my attachments? Pema Pera: btw Bog, do you mind if we mention your SL name in our blog, with some snippets of our conversations? Rajah arrives as Pema is leaving. Rajah Yalin: hi there - how come we’re outside? Pia Iger: I had tea, sake, yet to taste coffee! Pema Pera: Fael, can you send the chat log later? Pema Pera: nice seeing you all here! Pema Pera: next time I’ll stay longer! Pia Iger: I took a snapshot of Fael for memory. Fael Illyar: during the show? Rajah Yalin is wondering what he missed. Moon Fargis: fael: can you edit your appeance? Fael Illyar: ok, everyone looking at me? Once more and then a duet is requested. Moon Fargis: how long did we take fo this fael did you count? Pia Iger: How delightful experience for my saturday morning! Pia Iger: Moon, can you do it too? Pia Iger: can Moon and Fael do a duet? Duet finished, several seconds apart for each one. Pia Iger: Wow, anyone missing this should feel sorry. Moon Fargis: cant we trigger the gesture with a word? Pia Iger: what lag? I have no techincal clue. After this Bogdaeius soon vanished. Fael Illyar: Yes, scripts are necessary if you want to synchronize things. Pia Iger: Anyway, I enjoy it as is. You two made a bell for PaB, now create a PaB repertoire! Moon Fargis: what do you think fael ? Moon Fargis: can you count from 10 to 0 ? Pia combines all the numbers into one line, which wasn’t quite what Moon had in mind. Pia Iger: Ok. got it. This time we got started closer to each other. Pia Iger: agree to the tour idea. Pia Iger: yes. it is a bit hard to be total in sync. I noticed that I hadn’t eaten anything in hours so I took my leave.